Only heater for entire home. 1x4 Door Jams above ceiling. 1x6 Fence Pickets above ceiling which turns out to be a patio cover. Carpet and Pad above ceiling for insulation. Ceiling studs installed the wrong direction. Wall bowing out. Walls being pushed away from Rafters. Top plate broken. Wall is bowing, I am holding/pulling walls together with 4x6x8 beam. which later I found bowed wall in. In the future I raised eye hook to just under top plate. Chain from window to window through middle wall. Back bedroom Rafters with support stud into bedroom ceiling. Also it has a collar tie but no rafter tie which allowed wall bowing. Back bedroom with carpet, pad and door jams above ceiling joist. Attic above Kitchen. 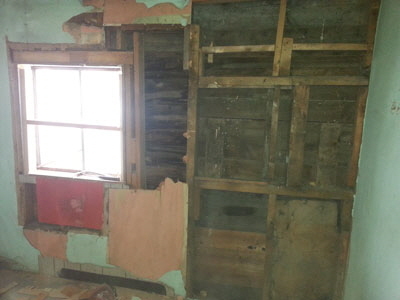 You can see original wall sticking out of insulation. 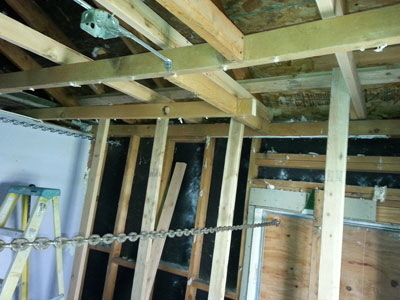 Ceiling joists were installed incorrectly(perpendicular) to rafters. Rafter to top plate with birdsmouth cut more than 25% of rafter which may have allowed walls to bow out more along with no rafter tie. Left 2x4 under rafter is only a support for ceiling. Not a roof support. Next we will raise the roof and pull in the walls and add support/repair damaged studs. After that we will continue removing carpet, pad and insulation along with ceilings and wall Sheetrock throughout the remaining 2/3 of home. We originally thought it would be a quick flip. But after we noticed the lack of insulation in the walls. 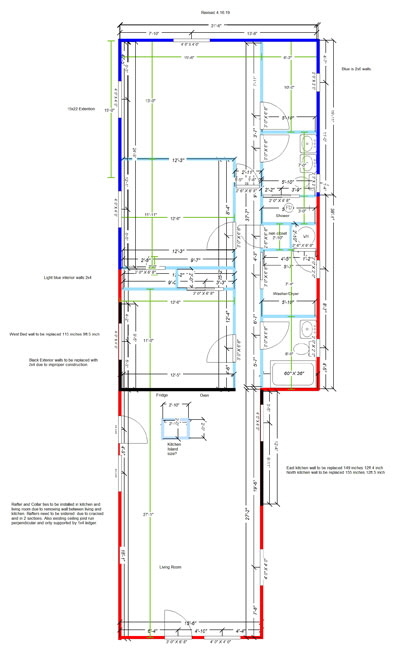 It snowballed into adding support where needed and possibly an addition renovation. Organic growth due to no roof vents. Above Bath and Bedroom Insulation removed. Existing patio cover roof with remaining insulation with no rafter ties. 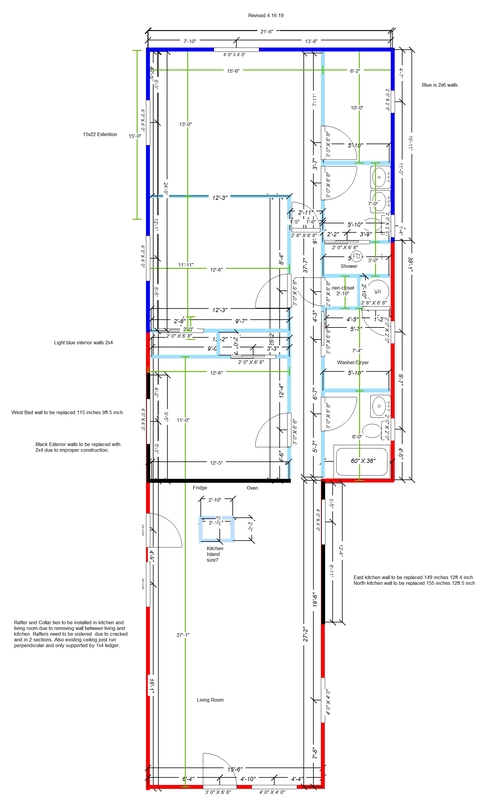 Insulation from above bed and bath. 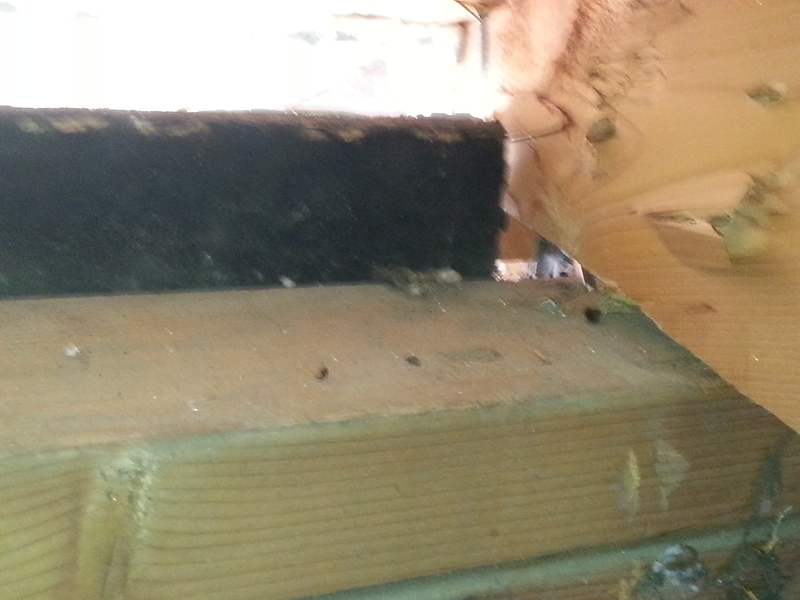 The ridge beam bottom is above rafter bottom and to support rafter we installed rafter brackets. Bare hot wire hidden in ceiling. 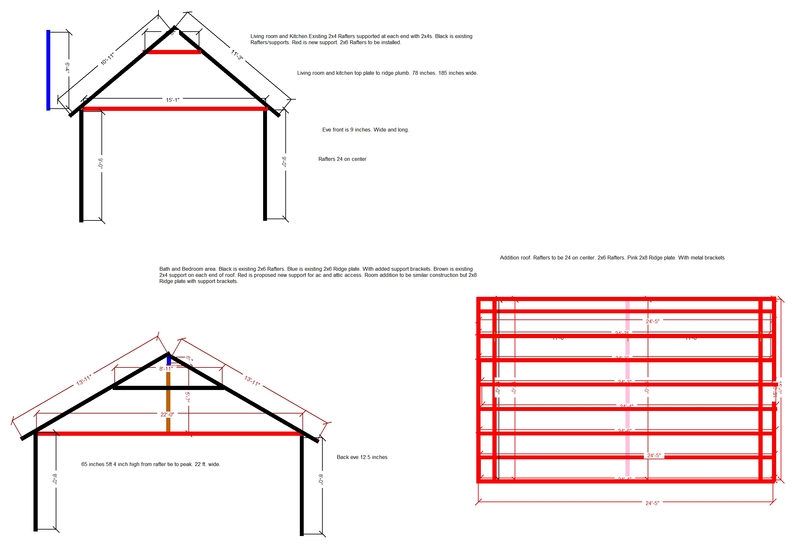 Installing Rafter ties above patio cover. Kitchen wall made of verticile 2x6. Installing Rafter ties above the existing patio cover. Raising the roof. I built a temp wall to pull in bowed wall and do wall repair to split top plate. In this picture you can see 2 of the three chains used to pull the wall in. Living room roof. No ridge beam, 1 collar tie and only 2 rafter ties. At least one rafter split and needs replacing. Plus I plan to add collar ties and rafter ties. I still need to research what to do about missing ridge beam.